Cambridge United manager Colin Calderwood praised his side’s ‘resolve’ after their last-ditch 3-2 victory over Northampton on Saturday. 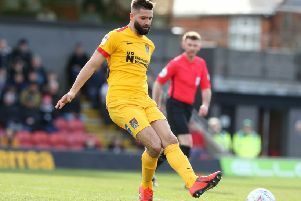 The former Cobblers boss oversaw his third straight victory in charge of United to lift them four points above the relegation zone, and within just two of Northampton in League Two. The U’s had to do it the hard way having twice trailed to goals from Aaron Pierre and Junior Morias on Saturday, but Jevani Brown and George Taft set up a grandstand finish before David Amoo won it with the last kick. “After about 30-odd minutes of the first-half the game had really deteriorated into them being able to control it a lot better than we would have liked at home,” Calderwood told Cambridge News. “We just lost our way completely. To get the goal near half-time kept us in it without doing anything. “The start of the second-half we found ourselves behind before we did anything right, but from then on in we pushed, we harried, we got the penalty which we missed. “If ever a team had a reason or an excuse to lie down and say it’s not our day, it might have been in the second-half but they kept going and I think the pace that we possess troubled them eventually. “There’s lots that I’m really happy with. In the first-half I don’t think we played for long enough and when they tired we used the ball so much better, we passed it better and somehow we dealt with their threat. “They’ve really dug deep today the players. In a situation down near the bottom of the league it’s awkward. “It can be fantastic game, a fantastic profession to play in but there are moments in your career when you think ‘this is really uncomfortable and I’m not enjoying it’. “That has definitely happened to the group here I’m sure this year. Somehow they’ve got a resolve and we kept getting opportunities that kept them going. “Certainly the back four defended really well when they had to but they were at full stretch. It’s great to see that they can go to that. We can break and lose of course, but they’ve given their all and I think we have to admire their courage.